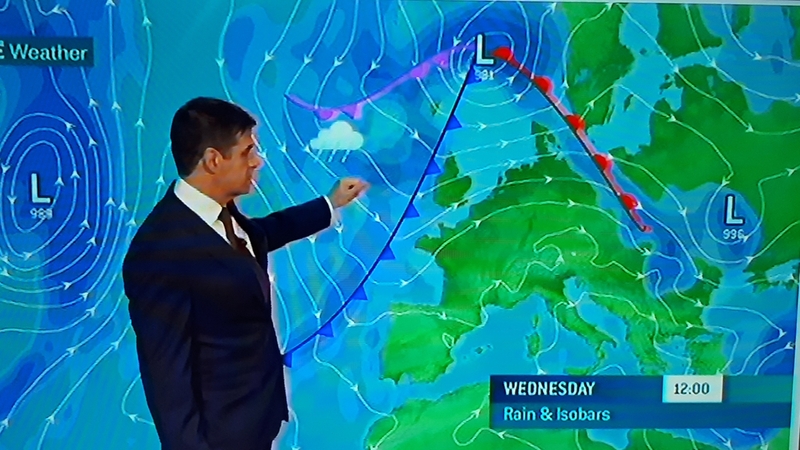 Gerry Murphy of Met Éireann forecasts on RTÉ. Met Éireann says the big high cell that has protected Ireland from the bitterly cold and snowy weather in Europe is set to give way to chillier and unsettled weather. Met Éireann forecasts the first half of the week to stay mild but it will turn colder and more unsettled around the middle of the week with widespread frost expected. Forecaster Gerry Murphy gave a taste of what's ahead in the weekly farming forecast on RTÉ. "A cold front will push down from the north on Tuesday night and that will bring much colder weather for the rest of the week with temperatures dropping back into single figures with some frost on some of the nights. We will see showers at times too so something of a change coming in our weather this week," he said on Sunday afternoon. It will be mild and mostly dry on Tuesday with a few bright spells. Overall, rather cloudy, with a little mist or drizzle, mainly on Atlantic coasts and on hills. Maximum temperatures 8 to 11 degrees, in mostly moderate southwesterly winds, fresh on west and northwest coasts. Winds will back southerly on Tuesday night and it will remain mild and mostly dry, with just patchy mist and drizzle, but more persistent rain will develop in Atlantic coastal counties. The weather is set to change on Wednesday. Rain will extend gradually eastwards across the country during the morning. Brighter conditions, with sunny spells, will follow from the Atlantic during the day, but a few scattered showers will develop in Atlantic coastal areas, becoming heavier and more frequent later, with a risk of hail, mainly along west and northwest coasts. Mild at first, but it will turn gradually colder, as southerly winds veer west to northwest in direction, the winds mostly light to moderate overland. Maximum afternoon temperatures 6 to 9 Celsius. Wednesday night will be dry in most areas, with clear intervals, but scattered showers will occur, mainly along northern, western and southwestern coasts, with a risk of hail and thunder. Very cold, with widespread frost. Min. minus 2 to plus 2 Celsius, coldest in the eastern half of the country. Fog patches possible also. Indications suggest that Thursday will be mainly dry, with sunny spells, but cloud will increase gradually. Very cold, in light northerly breezes. Maximum temperatures 4 to 7 Celsius. Very cold overnight, with a risk of sharp frost where breaks in cloud occur, especially in the north. Min. minus 3 to plus 3 Celsius. There will be a risk of fog also, in near calm conditions. Friday and weekend will remain quite unsettled and changeable, with a good deal of cloud and some rain or sleet at times. Still quite cold, with a risk of frost at night where breaks in cloud occur.